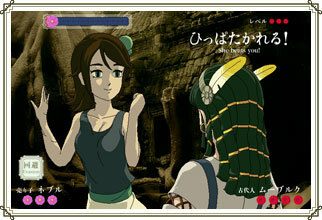 Welcome to the 10th Flash game by NIGORO, where heroines from La-Mulana do battle in the world of Rose & Camellia! Who is the true heroine of La-Mulana? This feud can only be ended by the strength of the hand! Mulbruk, self claimed heroine and Ancient has been sleeping for 3000 years within the ruins of LA-MULANA. She’s fighting for the title of Heroine of La-Mulana! 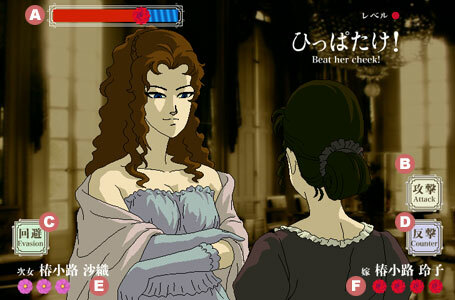 In this mini-game, self-proclaimed heroine Mulbruk enters into one on one fights with other candidates, hoping to slap and knock out each one. You and your opponent try to slap each other until one side has lost all her health; the one left standing is the victor. During your attack phase, press the attack button to ready a swing, then move the cursor to your opponent’s face to execute a slap. You can attack as many times as you like until time is up. If your slap is too feeble, you may open yourself up to a counterattack from your opponent. During the enemy’s attack phase, press the evade button, then pull the cursor near Reiko’s back to dodge the enemy’s slap. After evading, you can attempt a counterattack. Of course, the enemy can also evade your attacks and hit you with high-damage Critical Slaps, so it is important to come at your enemy as fast and furious as possible. Such is the genteel art of face-slapping, passed down from ante-Christum through generations of women. While it is considered a form of combat, it has strict rules, and in some circles is even considered a sport. The 3019 year old daughter of an Ancient. She has trouble waking up, as she has been sleeping for 3000 years. On this occasion, she fights armed with a firm hand, and plenty of insults. The salesclerk who sold weights to adventurers on the surface before La-Mulana was remade. She speaks softly, but angers easily. She is a sister’s ghost who has been eternally being sacrificing in Gate of Illusion. She might be hanging around the ruin to scare venturers. She is the same size as a human because she is the Queen. She is in great shape because she is the Queen. Click the Start button on the title screen to start the game and view the opening cutscene. At the end of this scene, the game will begin. You can adjust the difficulty settings before you click the Start button. There are five levels of ascending difficulty. Once the battle begins, the time bar will begin to move. If the time bar is blue, it is your turn to attack. Click the Attack button, then bring the cursor to your enemy’s face in a slapping motion. Striking her cheek will result in a successful slap. If your slap is too slow or too far off target, the enemy will dodge, and you may open yourself up for a counterattack. If the time bar is red, it’s the enemy’s turn to attack. Click the Evade button and move the cursor near Reiko’s back in a dodging motion. If you are successful, you will evade the enemy’s attack and the Counter button will appear. You can click this button to counterattack, but if you miss, the enemy will strike you. Whittle your enemy’s health down to zero to clear the stage. If your health hits zero, the game is over. During your attack, if you aim for a specific spot, you can achieve a Critical Slap for extra damage. Critical spots vary depending on the enemy.